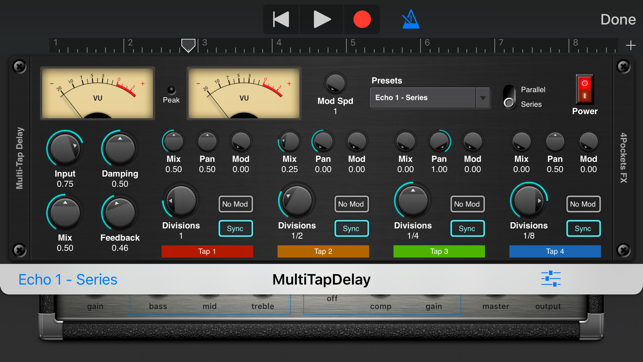 The Multi-Tap delay takes the traditional digital delay to the next level. Instead of a single delay line you have up to 4 taps at your disposal. Each tap has an adjustable delay which can either be a value in milliseconds or a division of a beat. This is because the effect tracks the host tempo and can automatically match the beat by just pressing the sync button on each tap. Some taps can be free running while others synced to the beat. What really makes this type of delay shine is that fact you can choose to either have all taps play back in series or stack them end on end in parallel mode. This allows for some very creative and unusual patterns which are not achievable using a conventional delay. A dedicated LFO synced to the host tempo can also be used to apply modulation to each of the taps. You can modulate the frequency to create a chorus/ensemble type effect, vary the amplitude to create a vibrato effect, create an oscillating pan or even run the tap in reverse echo mode or through a band pass filter. 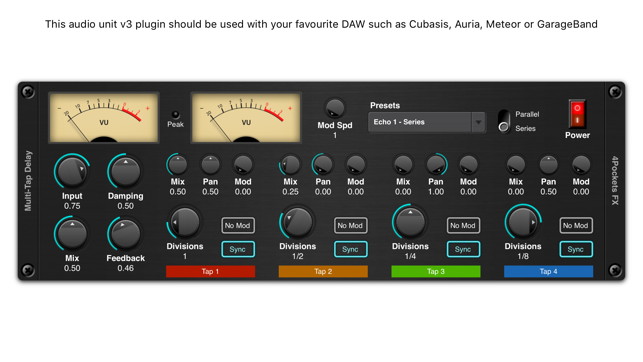 This is a great tool to have at your disposal, allowing you to some unusual delay effects not available with a conventional delay. All parameters fully support automation. Fixed an issue loading multiple instances of the plugin.